I visited my hometown yesterday. I was born in raised in a small town in California. I lived in the same house on the same street until I went to college. Yesterday I visited my hometown after a 8 year absence. Nothing was the same. Everything looked smaller, and closer together. Why is that? I mean I was the same height 8 years ago and yet my memory immediately goes to when I was 9 or 10. The town is far from quaint anymore. It’s ugly. We drove by one of my elementary schools to find it boarded up. My school boarded up! Most of the town is run-down and it is obvious there has been some poor planning. The house I lived in for my first 17 years of my life is now a daycare. Some of the birch trees I used to hide behind in the church yard on the corner are gone. The mortuary on the corner opposite the church looks much nicer. I think they’ve been getting quite a bit of business. From the looks of the town I can see why they would. At least Jerry’s restaurant’s sign hasn’t changed in hmmm, 60 years? I just hope the food isn’t that old. I guess it isn’t good to go back to your hometown. Goodbye, Hollister, California. 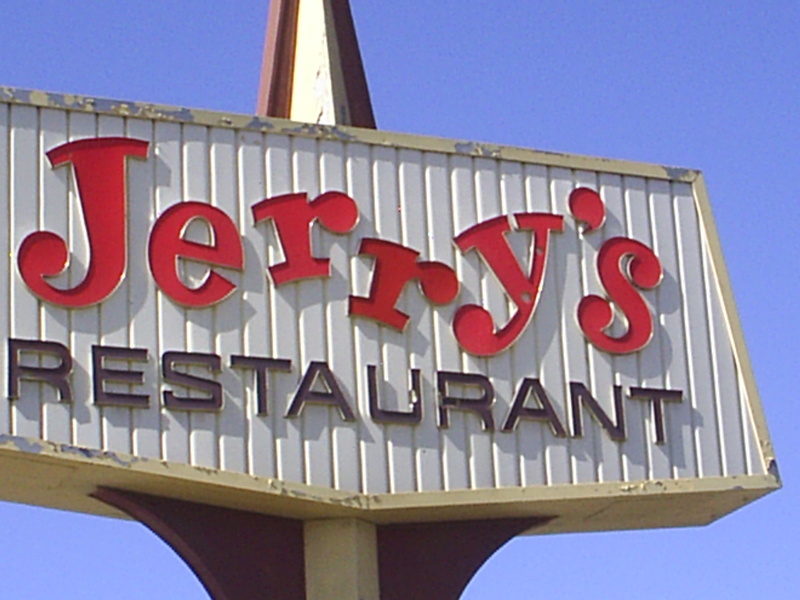 Goodbye, Jerry’s restaurant, goodbye. I’ve read some great humor blogs. I mean I have read some blogs that have made me stand in awe at how well these bloggers have crafted such phrases of wit. These writers make writing humor look easy. Writing humor is far from easy. And after reading those blogs, I think about never picking up a pen keyboard again. I’ve also seen articles labeled as “humor” that made me cringe a bit. I write for a website every now and then. Actually I write for a few websites every now and then. Anyway, this website is a collaboration of different writers about various topics. It has a humor section. Well, it has a section labeled “humor”. I have read article after article in that section and have not even come close to smiling. I have cringed many times. I don’t think humor is even a target when they have written these articles. At least I hope it isn’t. Maybe they are putting their articles in the wrong subject? I know that I’m no Seinfeld (his birthday is the day after mine though, so I think that means I have the potential. I’m not even close to being as old as him though. I’m not taking about the year he was born); however, I also know that I can make people laugh once in awhile with my writing. As strange as it might sound, reading those articles actually gave me some hope. I figure if that many people can write so much that isn’t even close to funny, then I have a reason not to quit. There are people that need my writing. The world would’nt be the same without my arduous attempts at making people smile. And for both of you readers out there, I pledge to continue on this writing journey until I make it to the White House. When we lived in Spain I had cravings for things I couldn’t get in Spain. Most of the cravings were so stupid because they were things that I wouldn’t normally buy here anyway. I remember wanting Dr Pepper. By the way, the period was deleted in the title in the 50’s so is it really a doctor or just a dr? Do you know how many times I have consumed Dr Pepper since I’ve been back in the states? Maybe one time if any (I did crave Reese’s cups in Spain as well, and sad to say I’ve had one or 50 of those since I’ve gotten back). Now that I can buy Dr Pepper everywhere it isn’t appealing. I am not a big soda/pop/carbonated beverage drinker anyway. I have some friends in Spain that are huge Coca Cola drinkers. The Coca Cola has to be the right temperature and just opened. There is no way to tighten that top tight enough for them to want to drink it again. Once that top is opened I think they only have like one hour to drink it at its peak of perfection. Usually, the only time a carbonated drink sounds good to me is with pizza. Today I was driving through a parking lot and saw an older gentleman putting a case of Diet Dr. Thunder in the trunk of the car. I immediately pictured him going home and asking his wife to pour him some Thunder on the Rocks. I actually thought it might be a good shot for a Viagra commercial. A little Thunder, a little Viagra and some more thunder… oh, sorry, forget that thought. After seeing Dr. Thunder I started to wonder about other imitation “Dr Peppers” out there. I had no idea there was the cult like following of Dr Pepper. I found these websites devoted to Dr Pepper and their quest to reveal the copycats. Supposedly there are something like 70 Dr imitations. Some of the interesting names are: Giant Eagle, Dr. Skipper, Mr. Green (isn’t this environmentally-safe cleaner? ), Dr. Perky, Mr. Pig, and Mr. Sipp. to name a few. Oh, and the women aren’t left out — there is also a Dr. Lynn. I wonder if Mr. Pig and Mr. Sipp are really imitating the old Mr. Pibb who was imitating Dr Pepper. Also before Dr. Thunder was a doctor it was Southern Lightening. I can see the progression from Southern Lightening to Dr. Thunder can’t you? Now, I’m no Pepper or Thunder expert, but I have read that some Dr. Pepper devotees believe that the Thunder is quite close to the original Dr Pepper. In summary, when I was a young girl my mom had us put vanilla extract in our pepsi, coke, whatever to make it taste better. It was like a vanilla coke. I guess that wasn’t in summary of anything, but I thought it would be nice to have a growing up/nostalgia story in this post. I remember when I first started this blog back in 1995…okay, a year and so ago. My first posts were such a rush. I was so excited to be writing and feeling this excitement that people I didn’t know would be reading my blog. And then when the first comments came it was also a thrill. Then I went through the “why am I blogging stage?” and…okay, I still go through those moments. I’ve gotten tired. Unlike those first few posts where there was excitement to see if any one read my words, now I am looking to see how many people read my posts and rating my writing on the response. The excitement is gone and I’ve gotten off track. I started blogging because I wanted to write. I still love writing. What I don’t love is checking out job postings for bloggers and writers that pay .02 a word. I realize that it used to be a “penny for your thoughts”, so it has doubled, but that is crazy. I also don’t like that writing can be tedious at times. Some times it is as if the words just pour out of my fingertips and other times I spend more time hitting the backspace key than anything else. I have a degree in accounting, so why can’t I just pound numbers all day and be done with it? Because, I still believe that I am suppose to write. Even if no one reads my words, even if people roll their eyes in my attempts to give someone a smile, no matter what, I am supposed to write. That is what I must focus on. Even when the rejection letters come in the mail, and my writing is far from entertaining, even then I must write. Have you ever had a splinter in the bottom of your foot? Okay, you probably haven’t. You haven’t walked around barefoot like I do. You are always properly clad with footwear. The other day I had a splinter on the bottom of my foot. It was annoying and I couldn’t imagine how big it was. We were out and about and I didn’t want to put my foot on the table next to the tomatillo salsa and start picking at it. I had to wait a while with this piece of wood digging into my foot as I munched on my chips and guacamole. Finally, I was in the privacy of our car and I got my tweezers out to take a look at the source of my bellyaching. I searched the bottom of my foot and finally found the tiny speckle causing my discomfort. This pain was caused by something smaller than a pinhead. It was a tiny little black dot at the bottom of my foot making me limp and cry in pain (okay, didn’t hurt that much, I’ve had 3 kids and no pain-killers, I’m tough). How could something so small on the bottom of my foot bother me so much? For the last two days, I have been frustrated by another little thing. We moved a couple of weeks ago (that is a huge story that I haven’t been able to tell–but, I will soon, complete with a tv news link later) and got our internet connected. The way the house was wired the best solution was a wireless network. Our laptop isn’t wireless so we had to by an adapter. This tiny wireles adapter has been the adapter from hell. At first I thought it might be normal to have your internet go down once in awhile, afterall, we are in a construction area. So, around the same time it would go out and I would think — huh, something tripped something or something and my internet access was interuppted (I’m a technical kinda gal you see). Well, after a few days the down time was happening quite regularly and our computer started to freeze up. So, I started to question if this was a service provider problem or an adapter problem. My sweet husband had set up the old laptap so I could use it. It is slow and has overheating problems (like I do sometimes), but I was able to get on it when this one went down. I started researching my little adapter doohickey and its compatability with Vista. This adapter had so many complaints on the manufacturers forum and not once did the manufacturer address them! So, here I was knowing I was going to have to replace the doohickey with another thingamajig that will probably not work either! I have to do this about 50 times a day, so the laughter is started to get old. But for now, I can get some writing done and feel like I have some control over something in my life. Of course, I can think that I have control, but that is just an illusion. And I will still walk around barefoot outside. 1. I want you to know this weekend I was able to eat Baskin Robbin’s Chocolate Peanut Butter ice cream. I know you were worried about this so I wanted you to know. 2. I know many of you were worried about how I left my kids in the car while I ran a quick errand. First of all, it was probably a total of 6 minutes and 27 seconds that I was actually in the pharmacy or I would have had more thoughts going through my brain. I make sure it is running just in case my 9 year old needs to move the car to a different parking spot. I leave a loaded gun on the seat next to him so he can keep intruders away. I leave a bag of hard candy for my 2 year old to munch on just in case he is hungry. I put the radio on a rap station so they can learn new words. I give my daughter a box of matches to play with so she doesn’t get bored.